Mom calls this "smoke on the water" weather. It is the most amazing place here in Hood River - the surf dog paradise we call home. 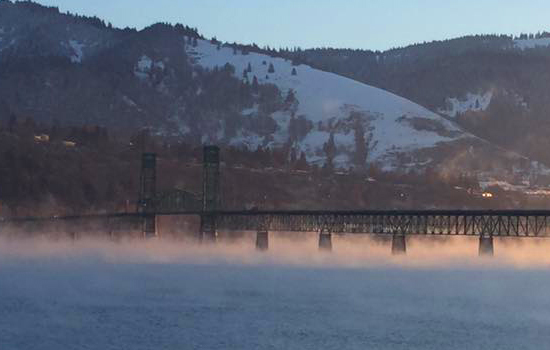 Here's our bridge, over our Columbia River this winter. On this side, we're in Oregon, looking over to our neighbors in Washington. We live and paddle with paws in both states. "Smoke on the water" is when the river we paddle on gets super-cold in winter (brrrrrr) - but the air temps get even super-colder. It has been 4 degrees here all week. The water is probably just above freezing. It's snowing like crazy. Snowmeggadon winter. Our salmon friends that swim beneath our boards, like cold water - like Smoke on the Water. But I'm a dinky doxie. I live for summers. I'm trying to embrace my inner snow dog, but I'm really a surf dog on the inside, Diary. Don't get me wrong- snow is fun. It's magical. It's where grown up surf dogs hang out. Ones that get bored of endless summers and too many people around. Snow and seasons are good. Here's our Hood River sandbar now.... (a.k.a. Dog River sandbar,) or should I say, "snowbar?" We LOVE paddling and windsurfing all around the Columbia River, and hanging in the sand on our own sandbar. This is the secret spot where the two rivers meet. The magical dog beach where the most amazing inland surf community ever - grew. Who knew? Dog River was the first name for Hood River. I like it better, of course. Here, standup paddle boarders (SUP dogs,) windsurfers, kite surfers, kayakers, white water rafters, outrigger paddlers, and so may other rad sportsters live and play. We get killer wind and waves and killer surf here every summer - 2 hours from the ocean - can you believe it? This is the windsurfing capital of the world. Talk about a "snowbar!!!" This pic, winter of 1929 in Hood River, Oregon, shows the Columbia River - our mighty river, life blood of the community - frozen completely over. Brrrrrrrrrrrrrrr. Mom says there's a thing called a 100 year storm. I'm asking for the not to happen, Diary. Please Diary, could you put in a good word for us? We love winter but we need help - to make sure we surf - but don't suffer.